Are you old school (paper) or new school (phone or tablet) when it comes to knitting patterns? I am a little bit of both. Sometimes I like having a paper copy of my pattern that I can make notes on (but always a copy…I NEVER write in my books or magazines), but if I am making something that has a small chart, I will upload the chart to my phone and use a app like GoodReader to view it. And of course there are the times when I use a combination of the two. I want to tell you about a cool new way CEY is offering patterns. When we started our new format in November, we wanted to not only have really nice books, but a way for you to access the pattern online. We came up with a plan that will have many of you jumping up and down for joy. If you purchase the hard copy of the pattern book from your LYS, you will notice on the inside of the back cover there is a scratch-off sticker and a link. If you follow the link and put in the code, found under the scratch-off, you will be able to download a copy of the book. Another great feature of this platform is that the download is provided through Ravelry, which means will be able to store the copy of your book in your Ravelry library and access it anywhere you have web access. If you don’t have a Ravelry account*, you can still use the link to download the PDF copy of the book. But you will want to make to save it to your computer as this is a one-time only download. If you try to use the code a second time, it will not work. I love this. Now I can have access to my pattern no matter where I am. How many times have you been at the doctor’s office (or dentist…or at the auto shop…or on the subway…or just about anywhere you take you knitting) and had to stop working, because you know you had to do something different with your knitting, but couldn’t remember what? Now you can pull your pattern up on your phone and keep going (now I just need to master the guesstimation of how many balls of yarn I need to bring with me). Please note this this feature is available only one way. The download code is available to you if you buy a hard copy of the book. Unfortunately we cannot offer it the other way around. Now that you have this great new way to view CEY patterns, I have to ask again…are you old school, new school or a combination? *For those you who may not have a Ravelryaccount, I ask WHY NOT? Ravelry is an awesome tool for fiber enthusiasts. You can see what other people are doing, talk about yarns and patterns (or just about anything else on their forums), use their ‘library’ of patterns to search for the perfect project, track your projects and so much more. The best part of Ravelry? It’s free! If you don’t already have an account, I encourage you to sign up today. I love afghans and blankets. No matter what time of year it is, I have at least one on the couch with me. In the winter I keep my place just slightly on the cool side, so I can snuggle up with an afghan. And even in the summer, there is always a blanket next to me on the couch – although it often just sits next to me and not over me. I am also currently in a nesting phase and although I have an afghan on the needles (I can’t wait till it is finished, so I can properly use it, and not just have it over my legs as I am knitting) which means I am already thinking about making another afghan (full disclosure…I still have about 40 inches left to knit on this afghan and might have another blanket on the needles). I have found myself walking up and down the aisles of our warehouse and wondering what would make the squishiest blanket. Clearly the answer is Chalet. Inge Spungen beat me to it. 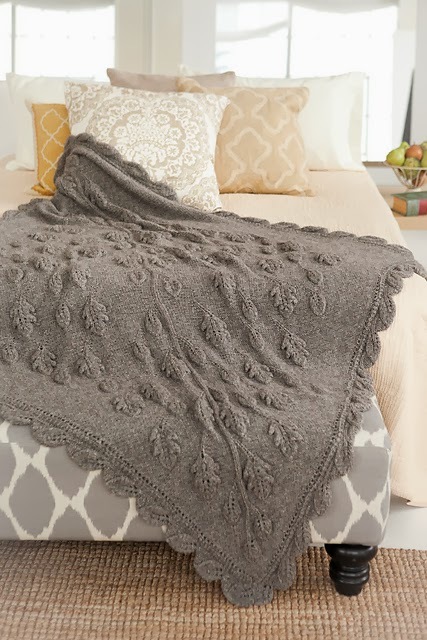 She designed the Leaf Blanket (above) for Vogue Knitting Winter 2013/14 using Chalet. And what a beautiful blanket it is. Starting with only 3 stitches this afghan is worked corner to corner and features a series of open work leaves on a background of reverse stockinette. To tie it all together the designer used a border with a leaf motif that is knit onto the blanket as you go for minimal finishing (my two favorite words in knitting), echoing the pattern on the body of the afghan. And because it is knit on such large needles it will go fast! 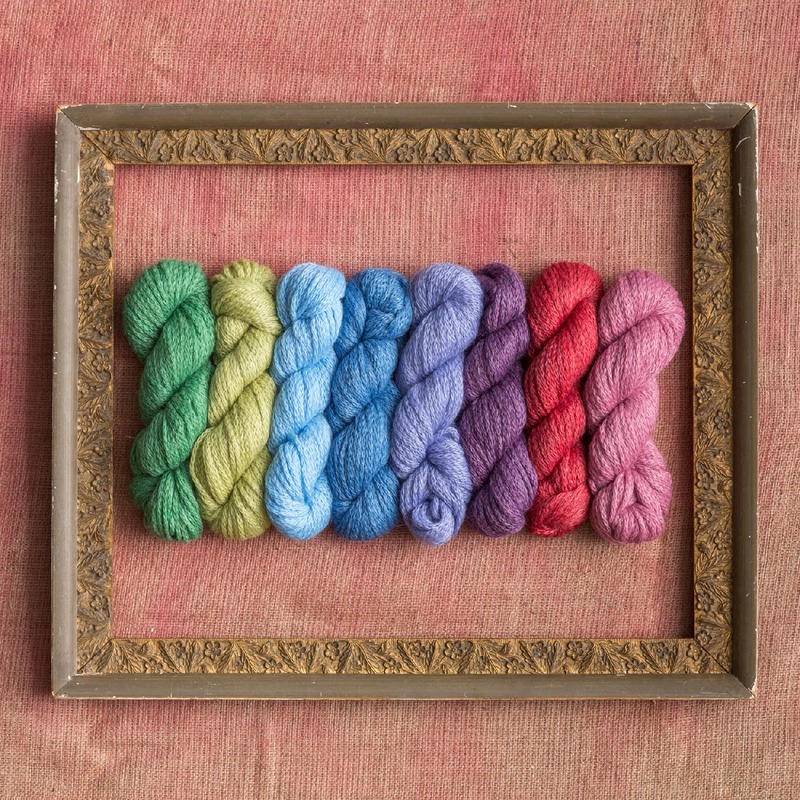 Chalet comes in 8 beautiful undyed colors. But sometimes you need a little color in your room. May I suggest Chateau? It is the same amazing base, but in 8 vibrant, heathery colors. What color will you use to make your blanket? This past weekend the temperatures here in New England got into the 50’s, which is very warm for mid-January. In fact it was so warm I went out with just a sweater and hat. All that is left of the snow we got a few weeks ago is the ugly polluted mounds in parking lots and by the side of the road (which I am really hoping will melt over the next few days). And although the weather professionals are telling us that a cold snap is coming in a few days I can’t help but think of spring! Spring is one of my favorite seasons. I love it when the days get longer and my layers get lighter. The only downside is that I have to put away a lot of my hand knit sweaters and scarves. The upside? I get to start knitting spring things. Now I know some of you are thinking “ Whoa….spring already? Come one, we still have February and March.” But I ask you this - have you ever noticed that heavy sweaters have a way of being finished towards the end of February, with only a few weeks to wear them? Happens to me every year, but this year I am going to plan ahead (or at least I have intentions to). With springtime in mind, I’m going to peruse Oceanside. It’s full of bright, summery garments and wraps perfect for warmer weather…whether you are lucky enough to live in a tropical climate, have tickets for a mid-winter getaway, or are just planning ahead. 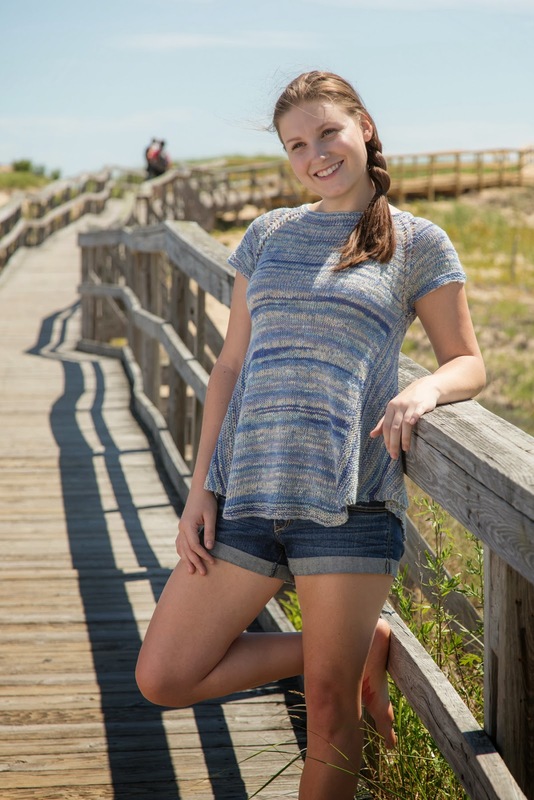 I think my favorite is Talulah, a top-down tee with mitered triangles at the side. I love the shape and swing of the garment. We were talking about this garment in a meeting once and I remarked that I thought it would be great for those of us who might like to de-emphasis the tummy. One of my co-workers said she thought it would be great for those who are looking to conceal their hips. Either way it is a win-win. The repeats of the Bella Lino (our newest yarn – more about that in an upcoming post) really show off all the angles of this modular piece. 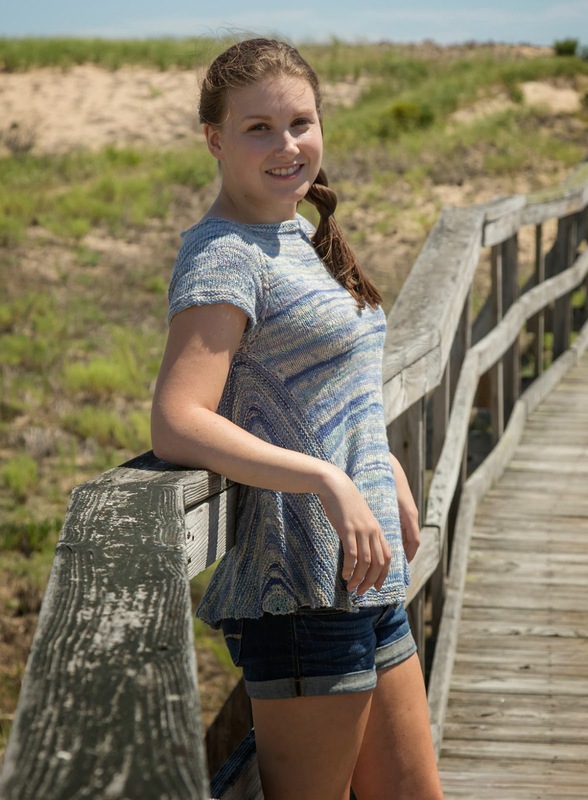 Another favorite is Nixie, also knit in Bella Lino. This tank is a great transition piece. I can imagine it under a jacket or oversized cardigan for now and with a cute skirt or even jeans for later. Draped necks are flattering on most people and the tucks add a bit of fun to the tank. Morgaine is also great layering piece. Knit using Silky Alpaca Lace, this lightweight top is simple and stunning with a little bit of drop stitch detail on the sleeves. The staple of any knitter’s wardrobe is shawls. And of course there are several shawls to choose from in Oceanside. From a triangle eyelet shawl in Bella Lino (Cordelia), to an open-work wrap in Firefly (Mouna), a Silky Alpaca Lace shawl with knitted fringe (Una) and a crescent shaped 3 color Soft Linen shawl (Geneva), there is at least one for you. There are a lot of other great pieces in this book. Check out this video that previews the entire book. I hope these get you inspired to ‘think spring’ no matter if it is 20° or 120°.